Take your chicken game to the next level with these cutlets. They get coated in our Italian seasoning, which coasts the meat in a layer of herby aromatics that smell as good as they taste. The sides are pretty special too, with tender roasted zucchini and mashed potatoes made rich by adding cream cheese and sour cream. 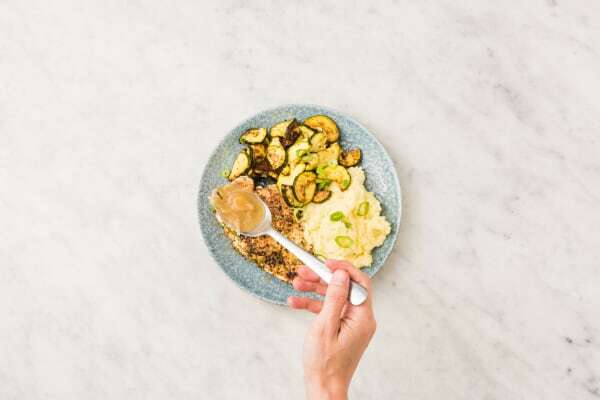 There’s also a pan gravy for saucing it all and ensuring that no bite is lacking in flavor. Adjust rack to upper position and preheat oven to 400 degrees. Wash and dry all produce. 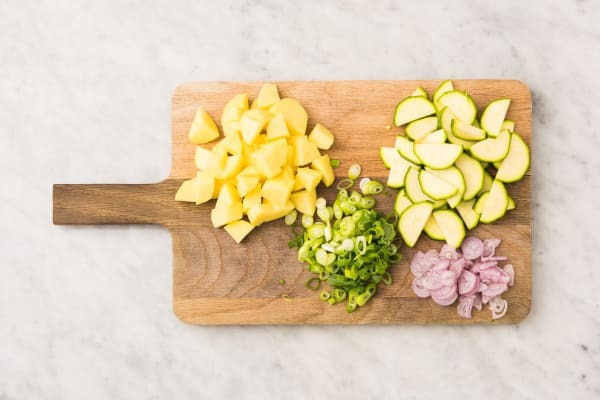 Halve zucchini lengthwise, then slice crosswise into ½-inch-thick half-moons. Zest and halve lemon. 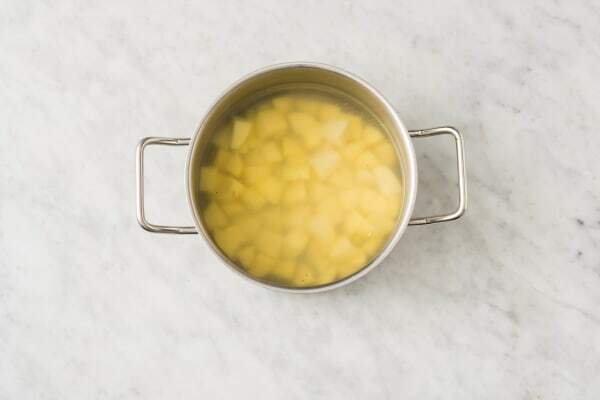 Peel potatoes, then cut into ½-inch pieces. Halve, peel, and thinly slice shallot. Trim, then thinly slice scallions. 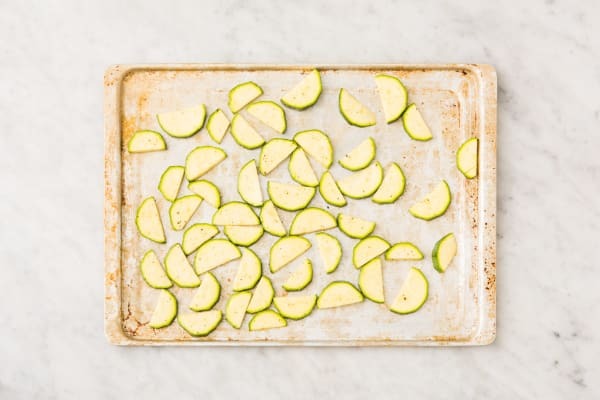 Toss zucchini with lemon zest, a drizzle of olive oil, salt, and pepper on a baking sheet. Place lemon halves on sheet beside zucchini. Roast, flipping halfway through, until tender and browned, about 10 minutes. Set aside, covered. Meanwhile, place potatoes in a medium pot with enough salted water to cover by 1 inch. Cover and bring to a boil over medium-high heat. Cook until tender, 12-15 minutes. Scoop out and reserve ½ cup cooking water, then drain. Return empty pot to stove over low heat and add 1 TBSP butter. 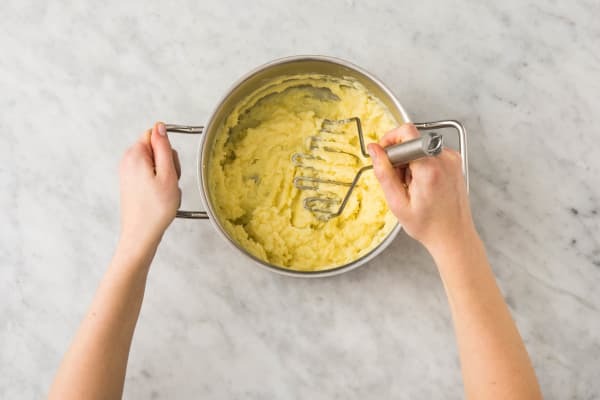 Once melted, return potatoes to pot; mash until smooth. Stir in cream cheese and sour cream. Add enough cooking water to create a creamy consistency (you may not use all). Season with plenty of salt and pepper. Set aside, covered to keep warm. Heat a large drizzle of oil in a large pan over medium-high heat. Pat chicken dry with paper towels. Season with salt, pepper, and Italian seasoning. Add chicken to pan and cook until no longer pink in center, 2-4 minutes per side. Set aside on a plate, covered. Add 2 TBSP butter and shallot to same pan over medium-high heat. Cook, stirring, until shallot softens slightly, 1-2 minutes. Stir in stock concentrate and ⅓ cup water, scraping up any browned bits on bottom. Bring to a boil, then lower heat and simmer until thick and saucy, 2-4 minutes. Season with salt and pepper. 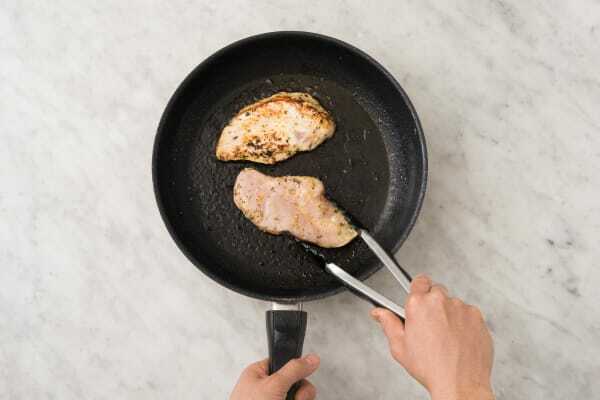 Reduce heat under pan to low and stir in any juices released by chicken. Top zucchini with as much juice from roasted lemon as you'd like; toss to coat. 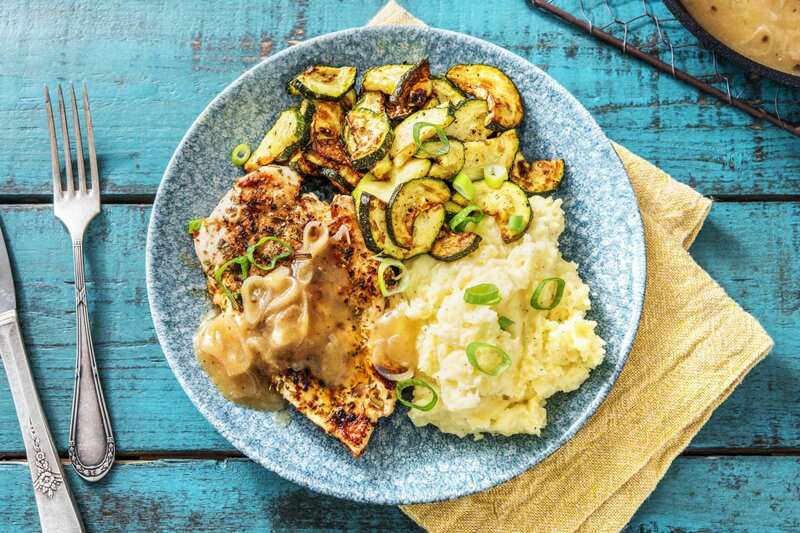 Divide chicken, potatoes, and zucchini between plates. Top chicken with sauce. Garnish with scallions and serve.